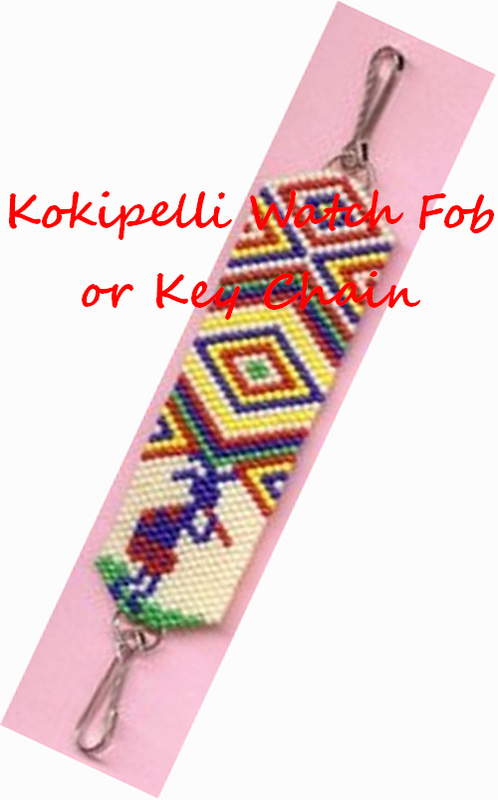 Kokipelli Watch Fob or Key Chain in Full color Chart/Graph Format. Finished Size (not including the hooks) 4 1/8" long x 1" wide. This American Indian Kokipelli watch Fob was made in about 5 hours and would make a Fast and Easy gift for the Hard to buy for person on your list! You could also make this into a bookmark by attatching fringe instead of the hooks on each end. This pattern includes: Suggested Delica, Bead Colors and counts, thumbnails of the finished Watch Fob Photos/instructions of how to attach the hooks.